a|e upgraded to 2.0 - The fluorescence laboratory. 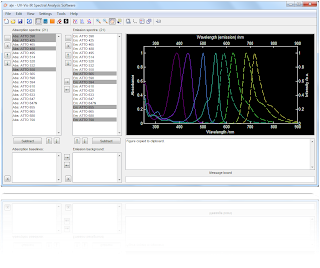 The UV-Vis-IR spectral analysis software a|e has received a considerable facelift and several new tools and improvements have been added. First of all, the GUI and program structure has been trimmed to allow new features and extensions to be more easily implemented. This includes a default settings structure and a smart-resizable GUI window. Many tools has been moved to new figure windows and popup info-boxes are now integrated into the software. The new default colors of the graph window is white axes on a black background. This can easily be changed back to black on white background from the View->Plot properties menu. Exported figures are always on a white background. One-click copy of graph to the clipboard. This addition greatly increases the speed of creating figures for Power Point presentation, Microsoft Word updates, etc.. The properties of the exported figure, such as its size and linewidths, can be customized from the (new) settings menu. A new spectral library of >300 dyes is implemented directly in the software. 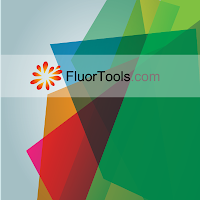 Currently, dye spectra from ATTO-Tec and Life Technologies have been included. The library is convenient for finding dyes based on their spectral properties. Copy data points to clipboard. The data can then be pasted into cell sheets in e.g. Origin Pro or Excel for further analysis. Import and export to/from Excel. A 'recent files' menu has been added. The plot window is now more customizable: Set default graph linewidths, linetypes, background color, etc. The data list can be grouped by colorizing listbox items. See the a|e page for more examples on new functionalities. The program now collects usage statistics - if the user chooses to allow this setting in the Help menu. Usage stats are 100% anonymous and does not give away any personal or data-related information. All it does is register the number of times a given tool has been used and uploads this count number to a server upon closing the software. Usage stats provides the developer, me, with insight into where there is room for improvement. The previous version 1.2 reached close to 250 downloads per month with the 3 most active countries being the Unites States, India and Germany. a|e was recently cited in JACS in which the spectral decomposition algorithm was used to fit spectra of mixed polymer-fullerene species. With the new amendments I can more easily build on the software in the future. Let me know if you have any particular needs or suggestions.